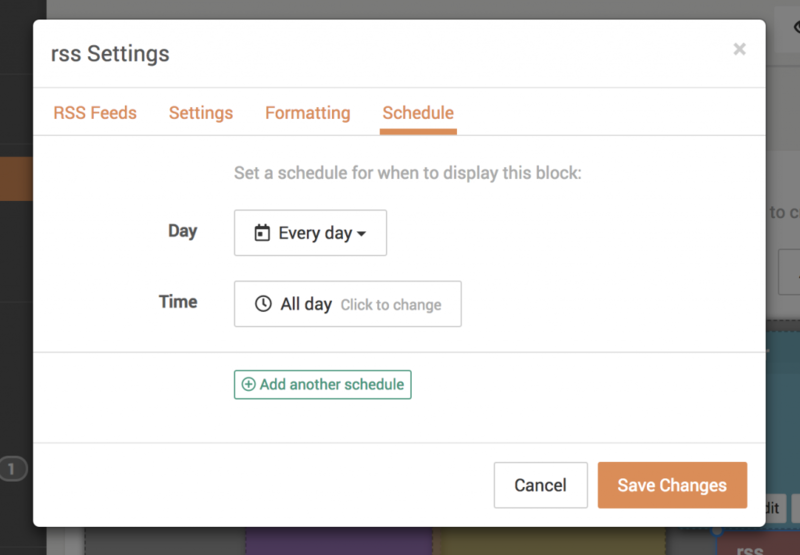 By default, the schedule is set to display the block all the time (Every day, all day). Set a specific day or time to have the block displayed only during the selected day and time. 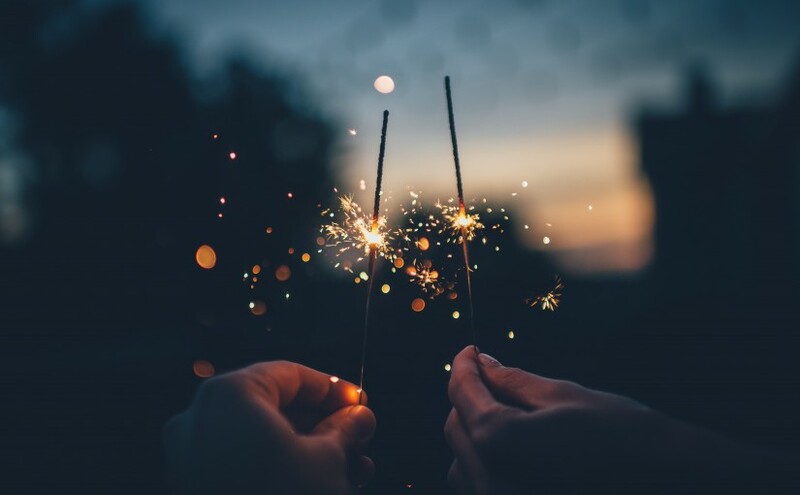 Use the schedule to show different sets of photos at various times of the day, show a news feed in the afternoon and stock quotes in the morning. Make a week-day and week-end screen all in one screen. The possibilities are endless! The order of the schedules does not matter, and if any one of the schedules would make the block active, the block will be active. If more than one entry would be visible at the same time, they will each be displayed on their own lines. 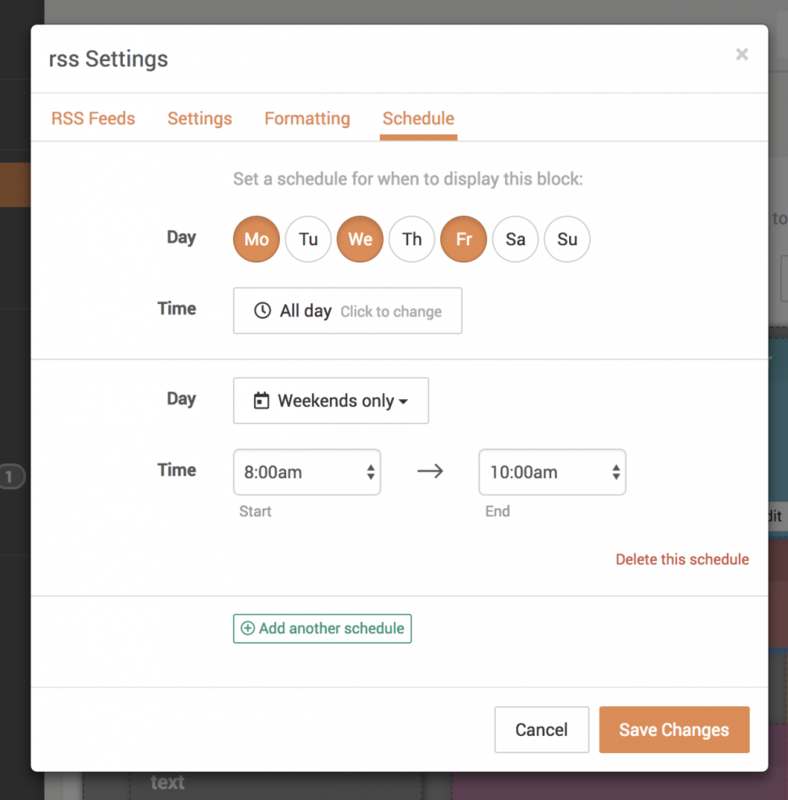 A scheduling block suggestion… it would be awesome if I could apply the schedule options to each individual rss feed. For example my daughters practice is in the same location AND IS A LONG LOCATION 3 times a week… so I would rather not see the location for hers where as my son’s practice is always at a different place and need it for his….. I would LOVE to be able to alter it for each calendar feed…. Thanks for reading this! 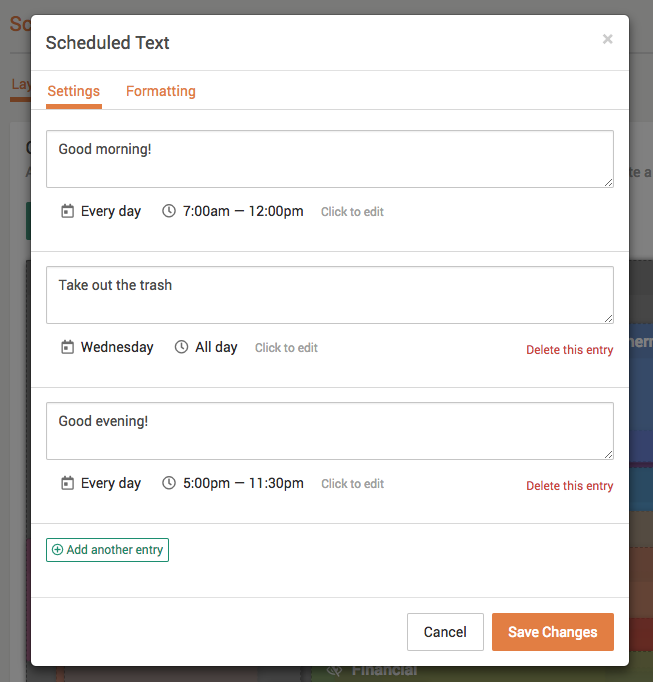 I like the scheduling feature. Could it be added to other items such as the countdown timer? I’d like to be able to use the same space for multiple timers through out the day. Even better would be the ability to group blocks and rotate through them during refreshes. While we’re at it, it would be great if the emergency weather alert could be set to opaque so that it doesn’t need its own dedicated space. It could then be placed in the same space as another, less critical, block and would effectively replace the block during weather emergencies. Hi Jack, thanks for the suggestions. We have added scheduling to the countdown block, and it looks like you’ve opened a feature request on our GitHub list for the weather alert. We’ll post any updates on GitHub when they’re available. Thanks! Could you elaborate on your “group blocks and rotate through them during refreshes” comment? I’m not quite sure what you’re referring to. Thanks. Next Next post: Spotify, Twitter and Reddit Integrations Added!